As Ocean Crest wraps up the Summer season with a beach festival, Lucy Berberian has her hands full running the family restaurant in addition to judging the sand castle contest and managing the food tasting event. When she finally gets a chance to get off her feet and take a stroll on the beach Lucy finds the body of a local business owner who seems to have rubbed a lot of people the wrong way all over town. The festival is cancelled, the entire town is upset since this is their last big hurrah to earn enough money to get through the off season. With a murderer loose, tourists just won’t feel safe and Lucy really wants the festival to continue. But it is having her BFF Katie named a suspect that forces her to break her no involvement rule and begin digging around to find out who did the deed. In typical Lucy fashion that means getting more involved than she should and that puts both Azad and Michael into protective male mode. With things finally starting to heat up between Lucy and Azad, this could put an end to their new beginning just as the murderer could put an end to Lucy. Love this series. Being a Jersey gal who grew up going to The Shore, this book takes me back to the water and boardwalk. You can almost smell the food and salty air. The characters are well developed and the writing and mystery are solid. Enough red herrings to keep you guess right up to the end. 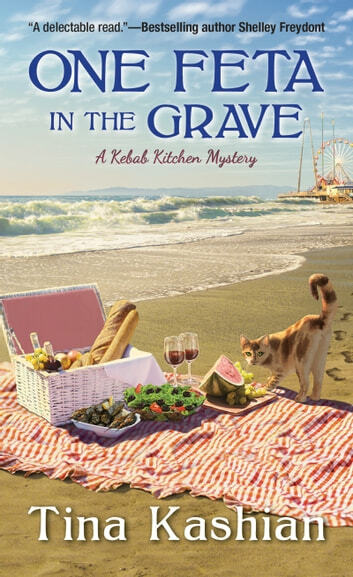 One Feta in the Grave is the third installment in A Kebab Kitchen Mystery series and each book can stand on its own. I thought One Feta in the Grave contained good writing with steady pacing. Lucy finds herself roped into helping at the beach festival courtesy of her best friend, Katie Watson who is responsible for the event. Unfortunately, Archie Kincaid and his rival, Harold Harper manage to cause trouble right from the beginning. Tina Kashian gives readers lovely descriptions of the town, the beach, and the various shops which brings the setting alive. Lucy has left behind her career as an attorney to run Kebab Kitchen and she has rekindled her romance with head chef, Azad Zakarian. Michael, who manages the bicycle rental shop for his uncle, is interested in Lucy and takes her out for long rides on his motorcycle. I must admit that I am partial to Michael over the hot-headed, jealous Azad. I like the various characters in the series as I find them likeable and relatable. I am especially fond of Lucy’s cute niece. There are luscious descriptions of the food cooked and served at Kebab Kitchen. Readers get to learn more about the food related to the Armenian culture. The mystery intrigued me since it could not be solved immediately (I love a good puzzle). There are multiple suspects who have good motive for harming Archie (at least in their eyes). There are recipes at the end of the book for lentil soup, date stuffed cookies, and Greek salad with feta cheese. 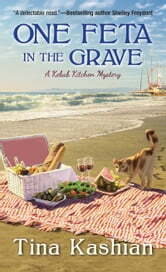 One Feta in the Grave is a fun, light cozy mystery that will have you longing for a sunny day at the beach. Join Lucy at the Jersey shore in One Feta in the Grave.